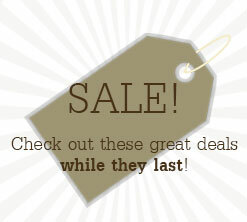 Many of us want to choose the things we buy with one eye on its environmental impact. It's not easy inside an office or school environment, but initiatives are rapidly creating a culture of conservation. The mantra "Recycle everything that can be, while generating less waste" is permeating educational institutions and corporations. 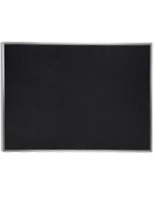 One way we are offering customers a choice is with our line of black rubber tackboards. 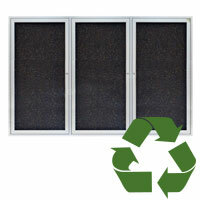 These bulletin boards feature pushpin surfaces made with either post-consumer or post-industrial recycled rubber. Once a consumer product has outlived its usefulness, it can be recovered and modified into a new product. Unlike post-industrial waste (which is generated by manufacturing), post-consumer waste is harder to collect and/or separate. However, the purpose of its recycling prevents vast amounts of garbage heading to landfills. When compared with traditional cork, these rubber models are a lot more durable and stand up to repeated pinning. 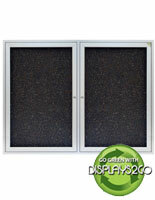 These rubber bulletin boards are a great way to disseminate messages, flyers, brochures, or schedules. They're an efficient way of getting the word out because promotional materials can be printed out once and posted for all to see. 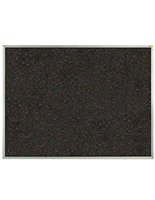 Each rubber bulletin board features a surface made of recycled black rubber for attaching such documents. The fixtures are also made with an aluminum frame with a polished silver finish for an understated but ageless look. 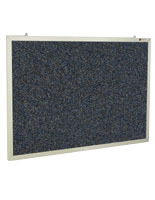 This type of rubber bulletin board, or self healing tackboard, is longstanding and affordably priced. Units like these are an ideal choice for company, school, or home use and they are available with either an enclosed or open face design. They readily mount to any wall and can be placed either vertically or horizontally. What other features do these pin boards come with? 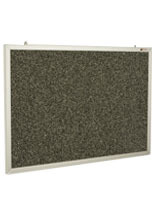 As previously mentioned, each rubber bulletin board features a black "cork" surface made of recycled materials. This composition is stain resistant, allowing them to keep a professional appearance for years. Their design also hides pinholes by automatically restoring to its original shape, thus making them self healing tackboards. Some bulletin boards feature a decorative "confetti" look that adds to the black finish. Models are available in a number of sizes including 18" x 24", 36" x 24", 48" x 36", 60" x 36" and 48" x 72". 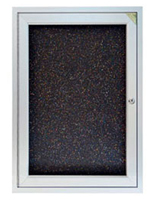 Rubber bulletin displays can include locking doors that will protect items being shown from theft or tampering. These feature a swing open design and are made with clear, shatter-resistant acrylic for additional strength. Each aluminum frame door also utilizes full length piano hinges that keep them from sagging for preserving their high quality look. Some recycled rubber bulletin displays feature multiple areas for posting notices. Open faced fixtures feature one place to attach documents, but enclosed units may have one, two or three. This is useful for dividing different types of publications or for creating interesting showcases. 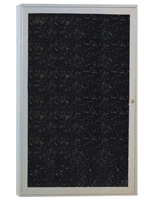 Each area of the recycled self healing tackboards' has its own door for extra security. 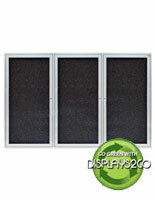 These stain resistant rubber bulletin displays are more than suitable for a number of environments. In schools, black enclosed bulletin boards can be used for showcasing exemplary papers and projects. They can also show awards won by students, teachers, or the establishment itself to impress visitors. Similarly, in offices, boards with an aluminum frame can feature papers detailing job openings, performance reports or pictures of merchandise. Employees could also use them to promote events or share other important information. Any building lobby can benefit from the self healing tackboards' ability to showcase notices while using green materials. Enclosed boards are an ideal choice for high traffic areas to prevent accidental or intentional tampering. Stain resistant rubber bulletin displays can also be used in the home for featuring diplomas, family achievements, children's drawings or to-do lists for chores. These eco-friendly pin boards have a wide variety of uses and are offered at an affordable price, making them an excellent fixture for any user!